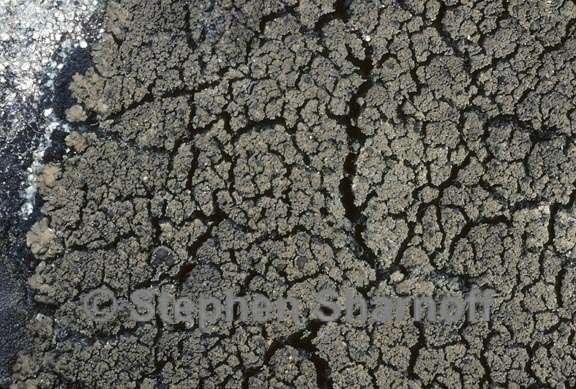 Thallus: squamulose, usually 3-5 cm diam., usually occurring on a blackish, well developed hypothallus squamules: rounded to 2-3 mm diam. 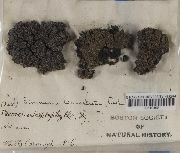 but sometimes with elongated marginal ones that are up to 3-4 mm long upper surface: brown to chestnut brown, sometimes paler, with white-felted tomentose margins upper cortex: paraplectenchymatous with irregularly thickened cell walls, 40-50 µm thick Apothecia: common, up to 1.5 mm diam. with brown, often with a white-felted thalline margin; disc: brown, plane and distinct; exciple: subparaplectenchymatous, 20-30 µm thick; hymenium: I+ blue-green and rapidly turning red-brown, c. 100 µm high asci: clavate to subcylindrical, with an internal amyloid tubes, 8-spored ascospores: simple, colorless, ellipsoid, with a conspicuous epispore which is broadly acuminate at both apices, 23-27 x 9-11 µm (with epispore; otherwise 14-18 x 8-9 µm) Spot tests: all reactions negative Secondary metabolites: containing terpenoids and aliphatic acids. 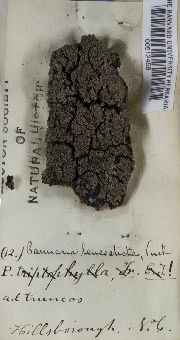 Substrate and ecology: on rocks (rhyolite) in oak/pine forest at 2200 m, elsewhere commonly on bark World distribution: temperate parts of eastern North America (including the West-Indies), SE Asia (as far South as New Guinea) and Mediterranean Europe (though extinct there since about 1900, see Jørgensen , p. 43) Sonoran distribution: rare, only collected once in the western Chihuahua. Notes: Curiosly it is often confused with Pannaria rubiginosa which is a much more large-lobed, grayer species with P+ orange thallus, and quite different hymenial characters. Perhaps easier confused with Pannaria subfusca which has smaller, P- lobes, but still with different hymenial characters and different thallus chemistry, and really not as distinctly small-squamulose without a white-felted margin.